Wet and wild today at times. 9 anglers fished the open so kept it fair and had 3 mini sections. Pegs 20-22, 24-26 and 28-30. Section 1 was won by Steve Royle who caught on the pellet waggler for a very respectable 91lb 6oz of Carp from peg 21 Second was myself with 57lb mostly skimmers with a nice munter as a bit of a bonus from peg 20 and third Matt Baxter with a 19lb mixed bag from peg 22. 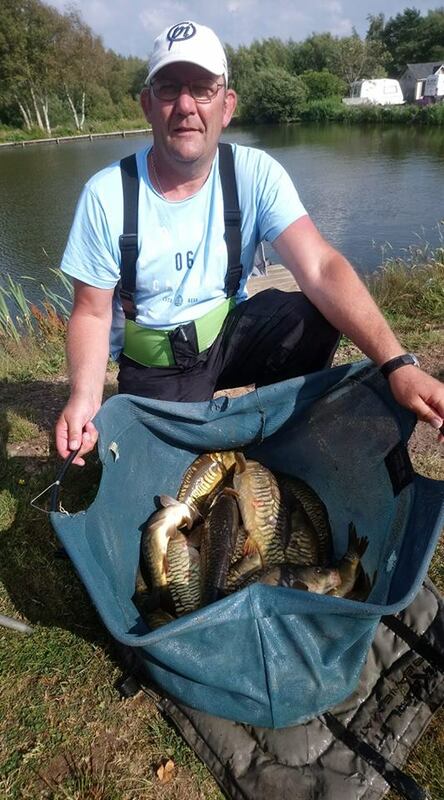 Section 2 was won by Rosen Arsov who caught mostly Carp for 42lb 14oz from peg 24, second was Don Lines on peg 26 who had a mixed bag for 38lb and third was Dave Walker with a good net of silvers for 21lb from peg 25. Section 3 was won by Ian Whitson with another good mixed bag from peg 28, tipping the scales at 49lb 10oz, second was Mark Acton with a mostly silvers bag from peg 29 for 28lb 8oz and third from peg 30 was Geoff Brough with a mixed bag for 19lb. Tough conditions well done all. Sorry no pictures due to the weather, think it drained everyone. Worth a mention Steve Royle’s feeder rod ended up in the lake, 2 hours later he caught a Carp on the pellet waggler and his feeder rod and a Carp on his feeder.